Earlier I presented a summary on the question of natural law. Akin to this is the subject of natural right. Natural right flowis from natural law as its legs for the real world. These rights as they are understood are the proposals of what natural law would seek to accomplish. And like natural law it is understood as not being dependent on any government or institution, not even culture. 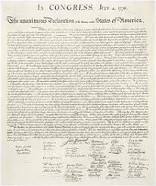 For instance, the rights to life, to liberty, and to pursue personal betterment are proclaimed in the Declaration of Independence as matters not subject to any governing authority. They are understood as a higher law. The principle of natural right often has a theological foundation, though not always, and when it does it is not necessarily Christian. Theistic proponents of natural right include Aquinas and Cicero along with Rationalist concepts such as the social contract, positive law/positive liberty, and classical republicanism. The ancient Hellenistic iteration shares features which appear as commonalities between the modern rationalist version and the Christian version. That may be because the Christian concept, notably coming by way of Aquinas, borrows heavily from the Hellenistic concepts. Aquinas’ view of right is constructed around the concept of justice akin to the Aristotelean system. Two centuries ago the dominant theology of the evangelical was postmillennialism. The goal of postmillennialism (let’s shorten that to “postmill” for the sake of convenience) is to prepare the world for Christ’s return. Thus the Christian is engaged in creating a better world that is ready for Christ to come back and rule. This includes all the institutions of government as well as private and ecclesiastical enterprises. This spawned the 18th century missions movement and William Carey’s vision and plan to effectively evangelize the world in a century to establish God’s kingdom. If the principles of the postmill sound at least similar to those of the modern progressive (“we can do it” or “we can do better” to make a better world) there is no mistaking the connection. The progressive ideology borrowed from both Marx for its sense of class and from postmill theology for its eschatos of a just society. This thinking became popular to the masses through the folk music movement of the 50s and 60s. Cass Elliot sang it in the popular song “There’s a New World Coming” in the 60s. Within the progressive hope for a better world is the explicit concept of natural right which is usually entitled positive liberty. President Obama argued for this with respect homosexual marriage and health care as well as other matters. He expressed it clearly on several occasions, notably in his farewell address. For the Christian it seems proper to ask the origin of natural right. We may treat it the same as we treat natural law, as a creation of God to serve the goal of human flourishing. But is that right? Is this a correct assessment of the situation Though these laws and rights transcend human existence they are none the less contingent rights. They were created to be consistent with the character of God. This is where questions develop for both the Christian and the secular view of natural right. What happens as theology develops? What if we through some period of change where we, while remaining orthodox in our theology, view the contingency of natural right as something less than fixed? Perhaps our concept of natural right could change so that ‘natural’ does not require these rights to be fixed but are instead fungible? Then the question becomes: On what foundation do we really have the right to life and liberty? Is that not entirely in the hand of God to grant and not for ours to assume? We might also question the secular expression of natural right as arbitrary rather than fixed. Does “universal” require them to be fixed? What if another worldview sometime in the future would dominate the United Nations and its proponents subsequently draft a differing set of rights? Is not a democratic drafting method by its nature arbitrary and developed as the constituency would vote? We see in the Word that God is the giver of life. A reading of Job serves this better than any sermon. God is sovereign. He takes life, He gives life. He gives pleasure and he gives pain. He restrains evil and he allows sin. Job seems a sound within its pages as an argument against a fixed body of natural right. This raises questions about our gospel and ethical presentations: Are we mistakenly communicating an American ideal as though it is part of our theology? I suspect we are. The idea of natural right (the Christian version) would not communicate the gospel correctly in North Korea or Pakistan. In short, it may even taint our presentation. Let’s be careful to keep our gospel Biblical. Gray, John, “Black Mass, Apocalyptic Religion and the Death of Utopia” documents this interchange.